Triangle pose will challenge children. It is somewhat more complex and will provide them with the opportunity to work on their strength and balance. Triangle pose is perfect for the active phase of your yoga session. Adjust the level of difficulty to the ages of the children in your group. If needed, stand behind children and support their arms to help them balance. Begin by performing mountain pose, with your feet at hip-width and your arms on either side of your body. As you breathe in, raise your right knee and move it forward. As you breathe out, turn your back foot 45 degrees. Breathe in and raise your arms to shoulder height. Breathe out very gently and bend your upper body forward, keeping your hips perfectly still. As you breathe in, set your right arm on your right foot and raise your back arm up towards the sky. Hold the pose for a few breaths. Raise your upper body, bring your arms back to either side of your body. Move your back leg up next to your front leg. Repeat these steps on the opposite side. Open, print, and laminate the following document: (Open triangle pose). Show children the picture and let them see you doing triangle pose. When should you use triangle pose? 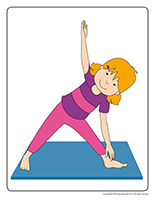 Triangle pose can help you work on children’s balance and muscle tone. Use it to challenge children physically. Triangle pose is perfect for the active phase of your yoga session. Add it to a sequence of poses in a standing position. Here is a suggested sequence: mountain, warrior, tree, triangle. This sequence will help develop children’s strength. For an easier version of this pose, don’t ask children to set their right hand on their foot. Have them hold the pose with their arms at shoulder height, bending their upper body forward. Execute the pose in constant movement: set your right hand on your foot as you breathe in. Bring your arms to shoulder height as you breathe out. Repeat without pausing.